Dateline West Yellowstone, MT. 2015 Snowshoot once again is in full swing and I find myself in the very hospitable town right on the west entrance to Yellowstone. Always a great place to visit, I especially like West in the winter. Just something about a town that is 100% focused on winter and recreating in the snow puts a smile on my face. Before I jump in to the details about the new hardware let me put a plug in for one of our favorite places in West Yellowstone. 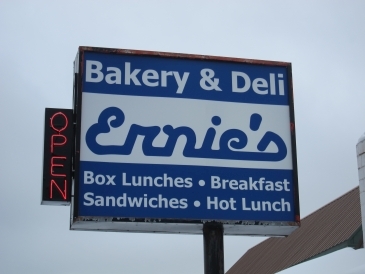 If you ever find yourself in West or passing through West or even in the general area of West, then you have to stop for either breakfast or especially lunch at Ernie’s Bakery and Deli. Ernie’s is a little place right on highway 20 right in the middle of town. They are only open for breakfast and lunch, but trust me when I say you have to eat here. Stop in, have one of the many sandwiches or burgers on the menu and pick out a baked-fresh daily item of some sort for desert. Or do like I do and take it with you for enjoying later. Now on to snowmobiles, the reason most of you are reading this. Unless you have spent your winter in the Bahamas, you know that the last couple of years have been good snow years. And this year especially in the Midwest and East have been crazy good. 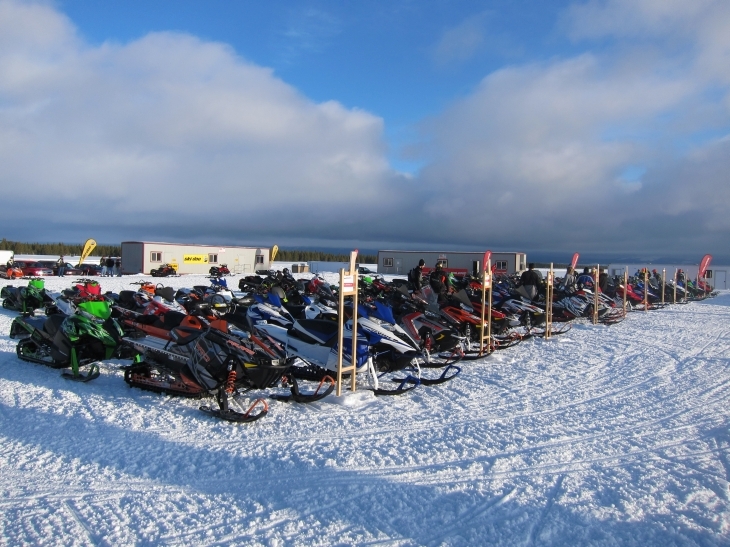 Nothing sells snowmobiles like snow, so upon arrival at the staging area and going through tech day it was understandable that everyone was pretty happy. Good snow, sales up over the previous year, and arguably the best snowmobiles we have ever seen from all the OEMs… that will put a smile on your face every day. I’m jumping in to Yamaha because the buzz continues around Yamaha. The new Viper was a huge success last year and so it only stands to reason that it would be expanded this year. The most obvious place we figured we would see new models were in the mountain segment and Yamaha delivered. For 2015 there are 4 new models in the Yamaha lineup, 3 of them in the mountain segment… the Viper M-TX 153, 153 SE and 162 SE. The 4 model lands in the crossover segment as the Viper S-TX DX. The M-TX models are based off the Viper chassis with that wonderfully smooth Genesis 3-cylinder 4-stroke motor. Calibration on the motor was revised again for this year and the power delivery and smoothness only seems to get better. The mountain sleds get a host of upgrades geared towards making the M-TX a better performer in the mountains. Running boards are wide and open, the seat is shorter than a standard seat with a taper to it that makes it easy to get back and forth across. There is no rear heat exchange, saving some weight and keeping the icing down. The mountain sled gets the single keel mountain ski with an adjustable ski stance between 38” and 39”. Under the rear sets the terrific Power Claw 2.6” track with new extrovert drivers and a redesigned rail profile and front torque arm. Standard models get the very good HPG shocks while special order models get Fox. However, as has been the case for the past couple of years, things get really fun with the M-TX when you opt for the Power Surge option. If you have been under a rock, the Power Surge is a factory approved, dealer installed boost option. I spent 2 days on a couple of different MT-X sleds with the MPI turbo and if you have read my articles before you know how much I like that combination. Snow conditions in West were good powder on top of a firm base. I found one of the most fun sleds was the 153 with the turbo. Yeah, it’s a 4-stroke… and so what. You want to go up big hills in deep snow, then climb on a turboed MT-X. In the snow conditions we had, the 153 with the turbo was an absolute kick in the pants to ride. Easily the most fun Yamaha mountain sled I have been on in memory. One of our test areas has a big side hill that you can pull 500-600 yard side hills on. Just stick the uphill ski in the slope and feather the throttle and the Viper sticks where you put it. Now I’m of the opinion that every Viper should come with a turbo, they are that much fun. And yes, this is a 4-stroke, but if you have been riding mountain sleds for as long as I have you can remember back to the “performance” sleds of the 90s. The M-TX is a 4-stroke that weighs in the range of the late 90s mountain sleds and with the MPI turbo makes 2x the horsepower… at 10,000 feet. I guarantee you it will make you smile. As I mentioned, the other brand new model is the S-TX DX which is a crossover sled. It comes with the deep-keel tuner skis and a 141×1.352 Cobra track. A great cross over. One of them at snowshoot even had a turbo on it so I’m hopeful it will be an option for the crossover crowd. It also has a terrific windshield that offers great protection, maybe the best of any snowmobile for 2015, a heated seat, and it comes standard with a new modular rear bumper/rack combo that allows for the addition of bags and other storage options as well as a passenger seat. Across the rest of the Yamaha lineup small improvements have been rolled out. Probably the most significant on the Vipers is the new Deep-Keel Tuner Ski. It’s a dual keel ski which is 5mm deeper keel, steeper keel angle and a raised bolt hole. All of that amounts to a more aggressive biting ski that performs better in the deep snow. Seems logical to jump right in to the Arctic Cats after the Yamahas. 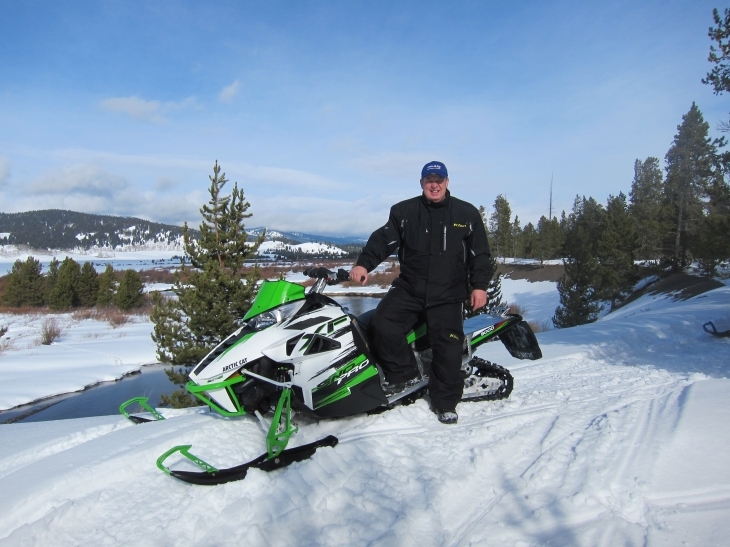 As with Yamaha, the partnership between these 2 companies has paid off for Arctic Cat. Not the least of which is to keep the factory purring along year round in Thief River. That’s a good thing. One piece of news out of the Cat camp this year that we thing is significant is that Suzuki has renewed their engine supply agreement with Arctic Cat “for the foreseeable” future. What that means is that Suzuki will keep supplying engines to Arctic Cat although they won’t be doing new engine development. If you had asked me last year I would have put money on our getting an 800cc 2-stroke based off the 600 platform, but we aren’t going to complain that the Suzuki 800 is still the 800cc offering. It is a wonderful motor with excellent HP and durability. The Arctic Cat lineup for 2015 is a huge array of metal that surely offers something for anyone and everyone. A quick count puts the available models in the 80+ with the custom signature offerings from Rob Kincaid and David McClure. Let’s talk about a couple of new models first. Last year Arctic Cat released their new 600cc 2-Stroke. Its proven to be a good motor throughout this past season and for 2015 Cat is expanding its use. The Thief River team did a couple of mid season releases using this motor, but for 2015 it is found throughout the lineup. 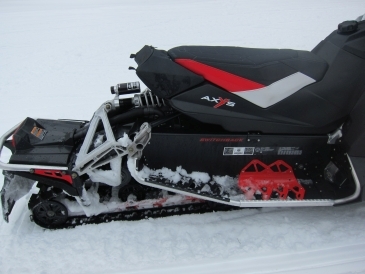 The XF 6000 (we’ll talk motor designations later) Cross Country is a cross over sled built on the Pro-Climb chassis. The XF sits atop a Cobra 141×1.6 track and is paired with Fox Float 3 and Cat IFP shocks and adjustable (42-43 inch) front suspension. 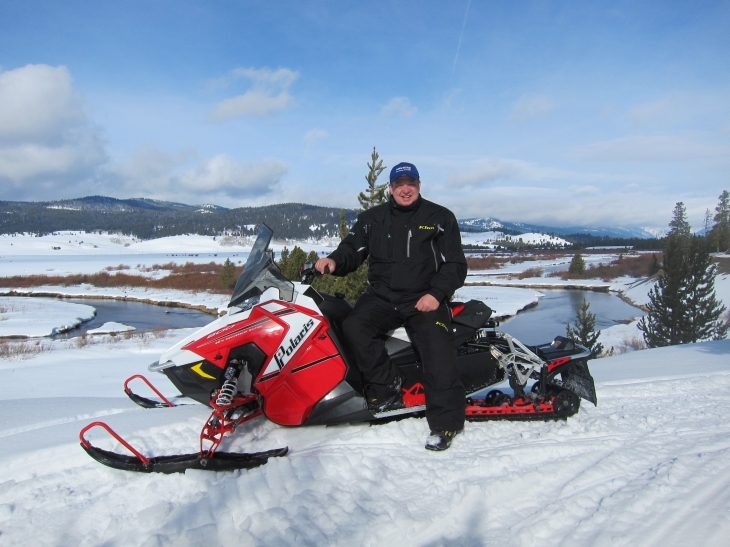 The cross over segment is growing and with the addition of the 600cc 2-stroke Cat gives us a great handling sled that is a very good performer for those back country logging roads and side trails. As with the 6000, another new model for this year is the XF 7000 (Yamaha 1049cc 4-stroke). Features with the 7000 mirror those on the 6000. The XFs come in 2 different flavors as well, the Cross Country and High Country. The Cross Country is geared more for trail use with occasional off-trail. The High Country, the opposite, more off-trail with occasional on-trail. The differences are that the Cross Country has a laydown steering post, 42-43 inch ski stance, dual skag skis and the 141×1.6 track. The High Country has the vertical steering post, 40-41 inch stance, single skag ski and gets the Power Class 141×2.25 track. With Suzuki on board fully, we get another set of new models in the ZR 4000 and 4000 RR offerings. The 4000s replace the F5 and Sno Pro 500 from years past with a new race inspired offering powered by the Suzuki 499cc EFI 2-stroke. With 2 models though, the ZR 4000 has something to offer to both the casual trail rider as well as the pseudo racer. The standard ZR 4000 has the Ripsaw II track in 1.0 inch lug and IFP shocks. The RR gets Fox Evolv X shocks and the Cobra 1.25 inch track. As popular as the Sno Pro 500 has been the new 4000 should be a hit with both the entry level crowd as well as the race circuit. Finally, probably the most anticipated new model from Cat is the Pantera. Yup, the retro trend continues with the comeback of the Pantera name plate. At Snowshoot the Arctic Cat guys referred to the Pantera as the Catillac Cruiser. That is where this sled is aimed, at the cruiser/touring market. It’s based on the ProTour chassis and is powered by the Yamaha 4-stroke motor… all good. We found the Pantera to be a very nice package. It comes with an auxiliary fuel tank that sits behind the passenger seat and provides an additional 4.3 gallons. It is not hooked in to the gauge and fuel is pulled from this auxiliary tank first, so your gauge will read full for quite some time as that 4.3 gallons is used up. We like the idea, we would like to see it gauged as well, after all this is a touring sled. And you will want to be careful when filling it as the filler opening is right in one of the storage areas. The Pantera has AWESOME mirrors. I know that sounds silly, but if you are a touring rider mirrors are important. In my opinion the mirrors on the Pantera are the best. We rode a combination of smooth and rough trails at all different speeds and the mirrors were always clear and buzz free and offer a great field of view. As you would expect the Pantera gets all the touring features… heated seats, good wind protection, detachable passenger seat, good luggage and also the 146 inch Arctic Cat Quiet Track. The rest of the Arctic Cat lineup gets tweaks, recalibrations and updates. The M sleds get a set of wheels on the front of the rails to prevent track stabbing. Also a new drive shaft with a change to a snap ring bearing mount instead of a taper lock. The Fox Float 3s are tweaked to allow for easier calibrating (add/remove air). 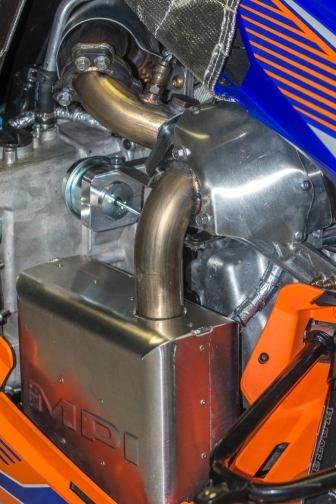 All M sleds get the HCR heat exchange which is a front mount exchanger eliminating the cooler at the back of the tunnel. Shaves off 4lbs and removes a source at the back that can contribute to ice buildup. That rumble you heard back in early March was the collective mountain divisions from Yamaha, Polaris and Arctic Cat pounding their conference tables when Ski-Doo introduced the new Summit X with T3. When I first heard about it I thought to myself, “No one has ever said to me ‘I need a 3” paddle track on my mountain sled’”. Well that didn’t take too long to change. And once I rode the T3 I started hearing myself say, “I need a 3” track on my mountain sled”. First off, let me say that the T3 works and works well. It isn’t just a Summit with a 3” track stuffed under it. And that is where the pleasant surprises come in to play. The T3 is offered in a 174 or 163 x 16 by 3 inch track in 3.0 pitch, changed from the standard 2.86 pitch. This is a Ski-Doo PowderMax track. 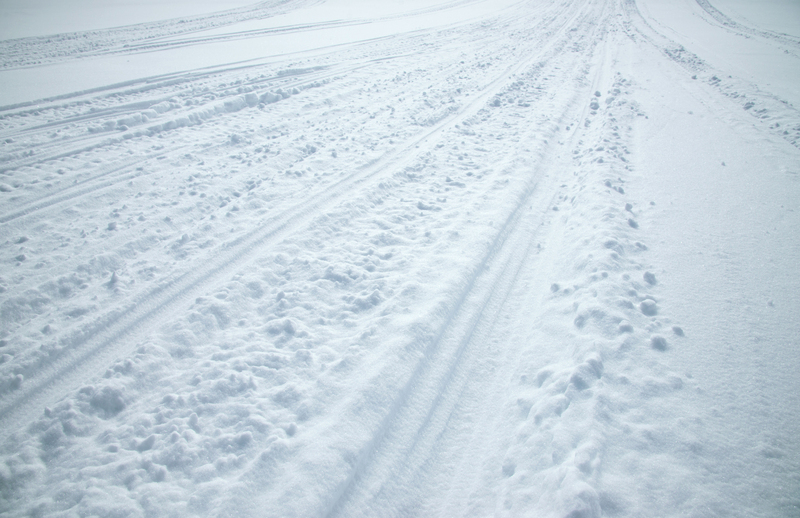 Yes, if you are climbing a big hill in really deep snow on the 174 and really grinding you are going to need to be serious about turning out when the time comes. It likes to go straight in those situations. The nice thing is that you likely won’t have to turn out until you get over the top. As I said, it isn’t just a 3” track stuffed under the Summit. The goal was to offer a complete package that would make the T3 a top performer and to do it by keeping the weight down. To do this the Ski-Doo guys went to a longer chaincase, redesigned muffler, revised cooling system, Pilot DS3 skis and some tweaks to the tMotion rear end. Also the front end was changed to the new RAS 2. All of these things resulted in weight savings so that the T3 163 weighs 10lbs less than the standard 163 2.5 Summit. To accommodate the 3” track the chaincase was lengthened and the rear suspension is dropped down in the tunnel. Anyone who knows me or has read my articles knows how much I have struggled over the past few years riding a Summit well. Doo has made changes over the past couple of years that have improved it, but it is still not the easiest mountain sled to ride, especially sidehilling and downhill reverse turns. Yes, the T3 is a going package and is causing the other OEMs to scramble to offer 3” accessory options. But the real surprise for me was that the geometry changes to accommodate the 3” track have cured my long standing difficulties with riding the Summit. 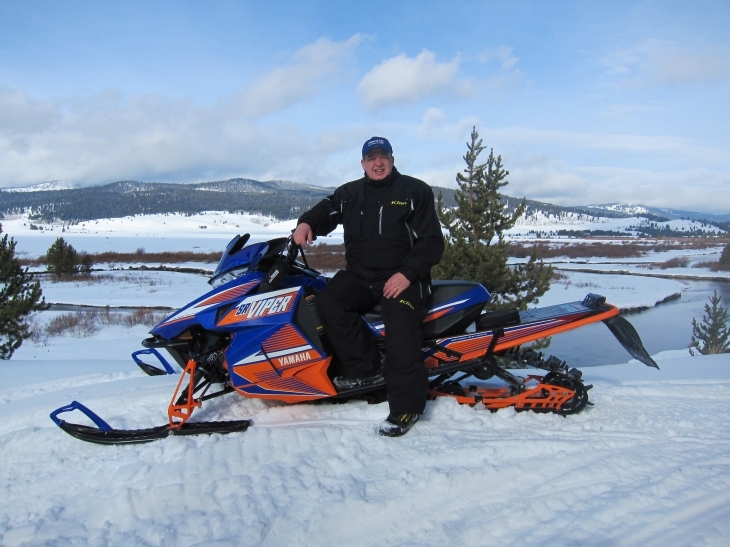 The 163 T3 that I spent my time on was a great handling sled both on and off the trail. Now it isn’t a trail rocket, no mountain sled is, but it handles the trails to the high country very well and when off trail it comes to life. It is easy to sidehill, turns like a dream and is very predictable. That became even more obvious when jumping back and forth between the standard Summit and the T3. It’s a great package. It is likely the best mountain sled for 2015… the only thing that could make that a guarantee would be if it was offered in a 153 track option. But don’t be afraid of the 163, it does handle very well and if you have struggled with riding Summits you need to swing a leg over the new T3. More big news out of the Canadian think tank is the new RAS 2 suspension. 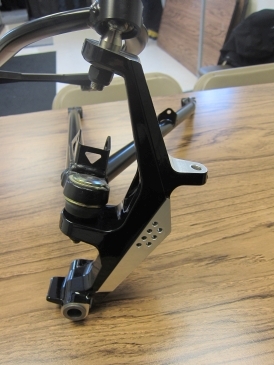 Most all of the Rev-XS sleds as well as the T3s get this new front end. Basically it was a change in geometry of the spindle, making it slightly taller as well as changing it to give a little more clearance. On paper, the numbers seem minor. On the trail, they are amazing. The Doos have had a terrific rear suspension in the rMotion for the past couple of years. But when pushing one hard, especially in the bumpy corners, the front end had a bit much ski lift. By a bit much I mean “Oh yikes” type of ski lift. The new RAS 2 front end has killed that lift. Go into the corner hard, pull on that inside bar end and just carve through the corner. Chatter bumps in the corners that used to make Doo riders nervous now are hardly noticed. Weather conditions one day in West kept the groomers in the garage so we had some rather rough trails. Not that I hope for rough trails, but getting a chance to try the MxZx out in those conditions was a kick in the pants. Big bumps, little bumps, chatter bumps, bottoming g-bumps… in the corners or on the straights, the MxZx just took it and kept going. The more time I spent on it the more confident I came as it never let me down. For me, ski lift is not a fun thing, so when it is gone the fun factor goes up dramatically. The combination of the RAS 2 and the rMotion suspensions make the Ski-Doos a contender for the best trail sled out there. 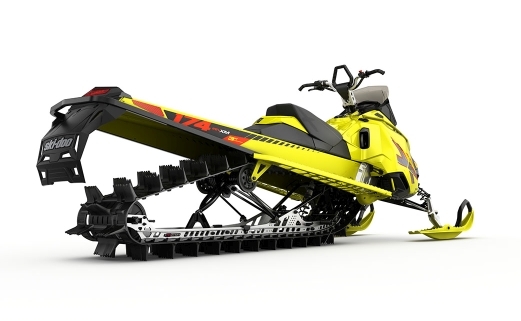 In the crossover segment Ski-Doo is rolling out the Renegade X-RS package. It’s a very interesting offering for the aggressive crossover rider. Basically they took the race sled MX Z X-RS features and put them on the crossover Renegade. You get the crazy good KYB Pro 40 shocks and the bump/jump handling they afford. As we predicted last year, the 900 ACE sleds were extremely popular and because of that the use of that motor is being expanded. I still really like that motor. In the 85-90 hp realm I’m not sure there is a better offering. The 900 expands into the Expedition and Skandic lines for next year. Along with the 600 ACE and 900 ACE for next year is a new throttle. The ACE machines all get the Intelligent Throttle Control (iTC) which is an electronic controlled throttle instead of cable controlled. This allows for the Sport/Standard/ECO modes as well as a Learning Key functionality. But along with that is the new ACE Finger throttle. Basically it’s a reversible throttle lever that you can use like a traditional thumb throttle or with the sled stopped you can spin it around 180 degrees so it becomes a pull throttle. I found it to be a great option, especially on longer trail ride runs. And finally, the DESS key gets a major rework for next year. If you have ridden a Ski-Doo you likely have experienced a problem at some point in time with the DESS key not making good contact and thus causing you to have a nice idling sled that won’t rev up. Well for 2015 Ski-Doo is switching to an RF based key. It doesn’t require metal to metal contact any more. It’s a ball and socket design and the key is required to be within a few millimeters of the ball. It’s a welcome change. Ok, I’m not going to drag this out. I’ll start off with one word: AXYS. After the past few years of success with the Rush snowmobile, Polaris took to the CAD machines and is giving us the new AXYS platform for the Rush and Switchback models. The goals of the AXYS were to offer a rider balanced chassis with great performance. To accomplish this, Polaris basically started fresh. The AXYS gets a new chassis with new rear suspension, a new 800 HO motor, weight savings throughout as well as some new comfort features like LED lights and a new full color gauge. 9 models land on the AXYS platform including 600 and 800 motors in the Pro S and Pro X models as well as Switchback models. 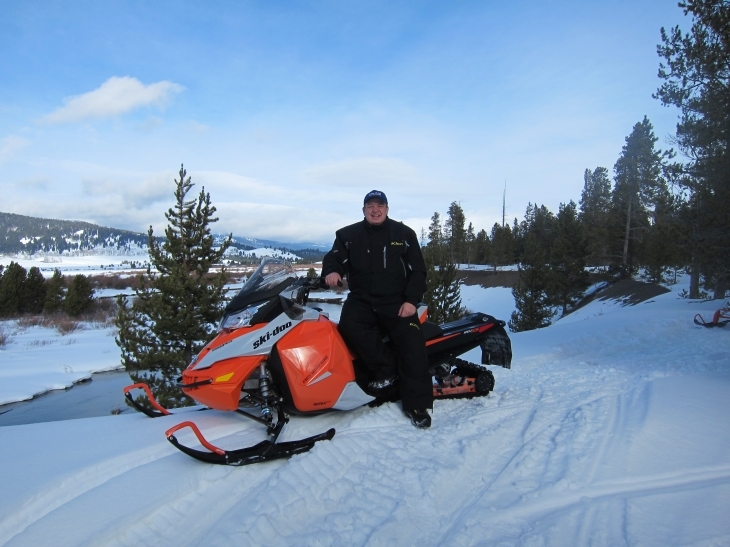 We spent a few days on the AXYS sleds getting a chance to ride them in about every trail condition you can imagine. We got to stretch the legs on the new 800 and do some seat of the pants comparisons. The AXYS is for sure a more controllable chassis for me. I always found the Rush to be sort of a fine line in control as I moved around on it. The new AXYS is really predictable and can very much be influenced by rider position. Jump forward on the seat and the skis will plant and bite like no other sled on the market. Move back on the seat and let the sled skip over the bumps. The AXYS is quite a bit lighter than the old Rush chassis, up to 38lbs lighter than some previous models. That is noticeable, it allows the sled to be ‘nimble’ if you will. I notice it as I move around on the sled, my body weight affecting the handling and therefor allowing me to influence the snowmobile. This is partly as a result of the rider position being moved forward 4.5” at the hands, knees and seat with the feet moving 2” forward. All good things. I did notice that the body work has a spot right at the shins that is not as smooth as it could be. It has a tendency over many miles to cause a little discomfort on the shins. If I’m on an AXYS I’m going to be looking for a padding option there. The other thing about the rider position moving forward is that it brings the front rear shock in to play more in dialing in the sled and making the suspension work. We found the Pro S and X to be pretty harsh in the big bumps. We, along with the factory guys with us, tweaked the rear rear shock and spring to help this out, but we never could get it to improve as much as we would like. As we sat around talking about it we realized that for the first time, ignoring that front rear shock is not going to be an option. With more weigh forward the big bumps are going to need to be handled some by that front shock. If you get an AXYS, make sure and pay attention to adjusting that front rear shock in order to get it to handle the big impacts. The new 800HO motor gets quite a few changes. The case is redesigned to allow for the mounting points to be integrated to the case. This eliminates the need for separate mounting straps bolted to the motor. The crankshaft gets a pork-chop treatment which saves 2.5lbs of rotating mass. Intake tract gets a redesign to improve flow and noise and a partnership with Motto Tassinari brings the new 3R Vforce reeds to the motor. 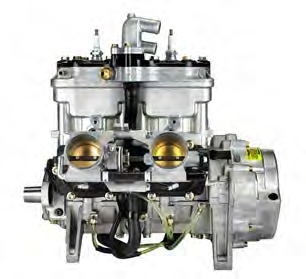 Polaris also has changed to an electronic oil pump that amongst other things reduces throttle effort. Very noticeable actually when you compare it to the mechanical pump and throttle pull. And the motor gets new 3-stage electronic controlled exhaust valves. All of those improvements should add up to a smoother, quieter, more fuel efficient power plant. Running an AXYS 800 side by side with a non-AXYS 800 didn’t really show any performance advantage to the HO. Take that for what it is, side by side comparison on a trail, but the new AXYS is a very nice platform with smooth motor, quick acceleration and lots of fun to ride. It handles as good as any sled on the market in the corners, especially when the corners start to get bumpy. The other news from the Polaris camp is the addition of 2 new Indy 155 models to the Indy lineup. The new models, the 550 Indy Voyageur 155 and 550 Indy Adventure 155 sit atop a new 155 articulated rear suspension. The back foot or so of the track can articulate to keep the sled on top of the snow when backing as well as improving trail handling. Along with that the 155s get the new Pro-Float ski. Think a ski that is 9.5” wide with a tipped up back so that the ski rides up well when backing. It has amazing float in the powder. I wouldn’t be surprised if more than a few mountain sleds end up with this ski on them next year. The rest of the Polaris lineup moves forward mostly unchanged. The snowcheck options are almost innumerable with colors and accessories and features. If you can’t find a Polaris snowmobile to suit your fancy then I’m not sure when you will. It’s shaping up to be another great year. The snowmobile industry is better off this year than it has been in a while, economy is improving and there is snow all through the snow belt, yup, that’s a recipe for smiles all around.